Shoppers entering a Wal-Mart Supercenter in Alabama got a reminder not to try anything funny: Two shoplifters stood outside with signs reading "I am a thief, I stole from Wal-Mart." Attalla City Judge Kenneth Robertson Jr. ordered the two people to wear the signs for four hours each during two successive Saturdays. 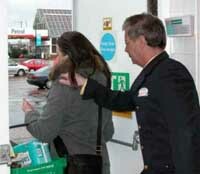 "The only comments we've heard so far have been positive," said store manager Neil Hawkins. "Most of them thought it was a good thing." One of the shoplifters, Lisa King Fithian, 46, wore the sign from 11 a.m. to 3 p.m. to avoid a 60-day jail sentence. Another convicted shoplifter was at the store from 3 p.m. to 7 p.m.
Fithian maintained her innocence. She said her conviction was based on a misunderstanding: She said she was taking a $7 item to the service desk because it would not scan. Outside the store, she said people who saw her wearing the sandwich board commented that the punishment was "cruel." Hawkins noted how embarrassing it would be for the public to see someone who got caught shoplifting. "Maybe they'll think twice about doing it," he said.